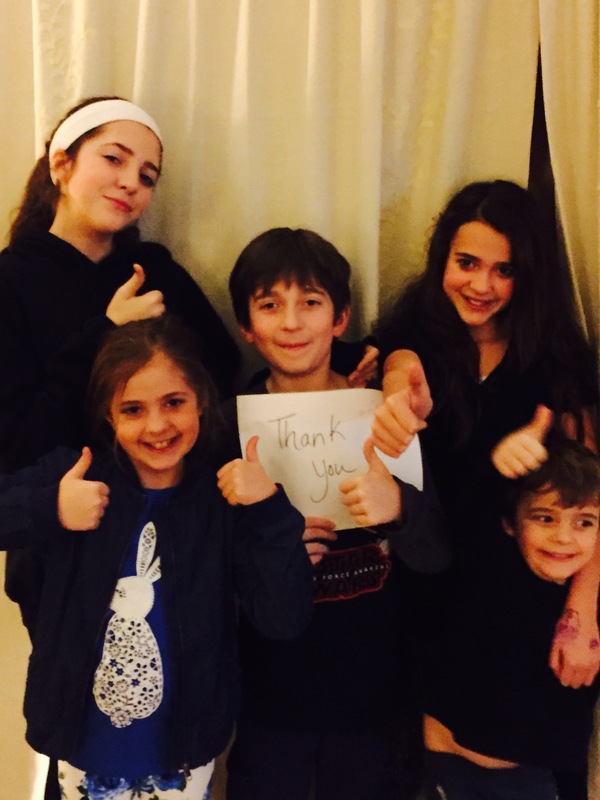 We love you for making our children feel important in the world outside of our home. We see you taking an interest in their lives, remembering they are in karate or in a play and you ask them about it or even show up at the event which means you are tracking the lives of possibly 30 kids at a time. Watching my own child’s 1st-grade soccer game is sometimes an exercise in patience for me as a parent, and seeing you attend just because my child invited you makes my heart want to burst. We love you for putting your students first. We see you scarfing your lunch down at that kidney-shaped table as you get materials ready for the student who will be spending that lunch hour getting extra math/writing/reading/rewrite-their-entire-Honors-English-essay help. We see you staying after school making plans for individual students to help give them a shot at getting past a tricky spot. Your day is about their success which often means even putting you need to see the inside of a bathroom on hold for 8 hours. For this we thank you. We love you for sharing your lives with your students and giving them a different perspective on the world. When my kid comes home excited about something totally new, like creating a crazy design out of PVC pipe as well as promotional materials for said invention because you have made this exciting, we are just drowning in joy. You teachers come from different kinds of families and backgrounds and interests. It’s through you and your stories my kids get to know about different people and places and ways of living. We love this. And along these same lines, we hope the parents of my former students were OK with me influencing a generation of my students to rock out to Air Supply. We love you for understanding when they come without a permission slip/mittens/math homework and not judging, just supporting and helping. Sometimes we don’t have it all together around here, but you know we are trying. 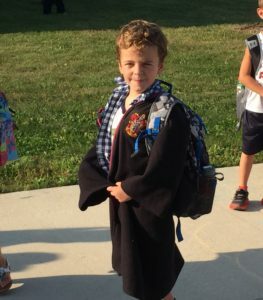 Thank you for acting like it’s totally normal for my first grader to show up to school wearing his Harry Potter robe instead of a jacket, you know the struggle at home on this point was just so real. When you send that second permission slip or the extra copy of the math homework before we even ask we are so grateful. We also appreciate you constantly checking the lost and found repeatedly for our lost whatevers. We are forever indebted to you for filling in our gaps. We love you for keeping the fun in childhood even when testing and standards threaten to squeeze this out. Lumberjack day, pizza parties, field trips, whole school Olympics, mini-courses to learn for two days anything you want with choices so endless we don’t know how we would pick (we’re torn between Day at the Spa and Tasty Tours), goofy birthday celebrations or book-it-and-bag-it all day reading days or ending the day with a dance party. Keeping the fun in the days of our kiddos is what they will always remember, so much more than the math or science. Childhood is short, thank you for embracing it. We love you for being the champion of the underdog…and the average joe… and the high flyer. We see how you love all your students and want more for all of them. You see the needs of each and strive to meet them. You really know them and are willing to fight for each and every one, sometimes when it seems no one else does. Thank you for being there for all of them. Even the ones that are not always easily loveable. We love you for refusing to be overwhelmed and instead just doing the next best thing you can do for your students. So much is thrown at you and the world just keeps talking only about what is wrong with education. It all lands on your lap and society just wants you to somehow fix it. Even in this culture, you quietly continue to do your work day in and day out. We see you finding the joy in your students and we know that this bolsters you. Thank you for your focus on the work, for leaving the stress at the door, for keeping your eye on the prize. We love you for sometimes ignoring us when we are clouded by being so close to our kiddos, your perspective makes me see my child more clearly. Our kids are taking a stab at being out in the world each day in your classroom, sometimes they will make a miss and sometimes those misses are big. Thank you for helping them negotiate this world and gently steering them back when needed. Thank you for being honest about their behavior and needs so we can do the same. Knowing we are working together makes all the difference….go Team Us. We love you for constantly striving to learn and grow so things can be better for your students even though this means more work for you. We see you bringing stacks of books home, reading constantly over the summer, attending countless classes on your own time, getting degrees that are expensive and get you nowhere financially, trying new ways of teaching that your literacy coach finds and that you might think are a little crazy, and constantly challenging yourself to keep on top of the best research out there. You do none of this for yourself, it is for your students. Your minds are wide open and learning and therefore your students’ minds can be too. We love you for being that person my child can’t wait to see. we thought we always would be my child’s favorite, but surprisingly we are A-OK with you taking this spot in my child’s world for this year. Your word might override mine in some areas, but we are just fine with you being the end-all-be-all of math instruction. We are happy to learn a new way to support you or to stand back and say, “Hmm….ask your teacher tomorrow, mom’s not sure” then we go back to being mom. 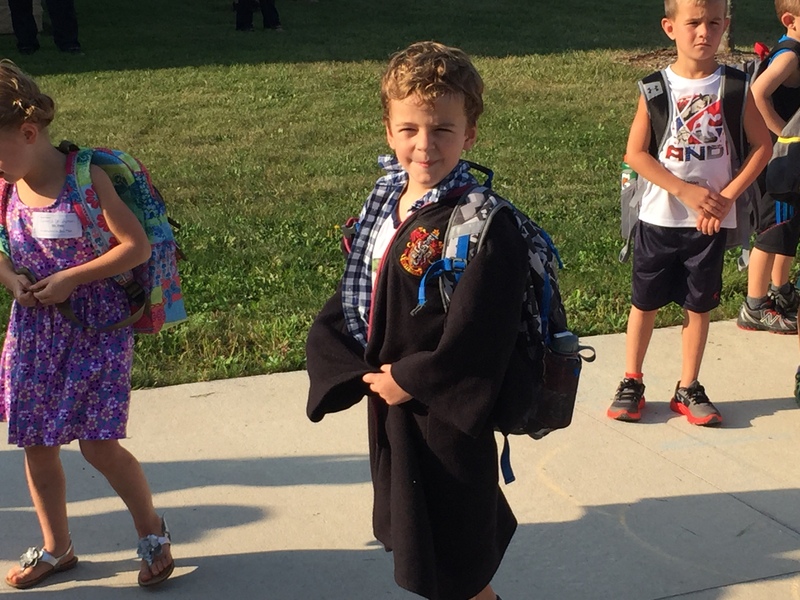 We love that our children can’t wait to get to school to see you each day and don’t want to leave 4K without telling you he loves you one more time or spends his morning wondering if your hair will be curly or straight today. A child who wants to be at school each day can’t help but learn so much. We adore you dear teachers, we are so lucky to have you in our kids’ lives. Know that you are loved and that we parents have your backs. Thanks for being in the trenches with us as we guide our children forward through this often crazy world. And a thank you from the kids too! ← New Year’s: Getting Grateful Up In Here! I am sitting here with tears in my eyes and joy in my heart. The Mom in me has felt this a million times over and you said it so beautifully. The teacher in me needed to hear this as my cup is way too full and I am so very exhausted. Thank you for energizing the best profession in the world!!! Without a doubt, this profession we have chosen, has blessed us too! Yes, just what you said! I am glad you feel energized and this professions blessings certainly go both ways. Happy weekend my friend!